Explore Mack Scogin/Merrill Elam Architects’ Knowlton Hall through high-definition video, photography, and virtual reality photospheres. The Knowlton Hall Virtual Tour, for iPad, Kindle, and Android Tablets. COLUMBUS—This project began with my personal dissatisfaction with books on architecture. Not with the writing, which add a richness and context and suggest a narrative into the thinking of the 20th Century, not just in architecture but in art, technology, history, philosophy, and politics, among others. Even the most influential authors of architectural history—Nikolaus Pevsner, Sigfried Giedion, Rayner Banham, Charles Jencks—are still constrained by the combination of type and image on printed page. Text and image crowd and fight for attention; illustrations—seldom sufficient to aid our understanding of often difficult text—may be bound in completely different sections, removed from the very writing they service. Even drawings and photography packed into monographs may still be difficult to assemble into a coherent whole. Is this detail on the northwest side of the interior, and how does that relate to the tectonics of the southern exterior? How does the view here different from the view there? What happens behind this wall, this door, or one floor down? Even thoughtfully reconciling photography with plans and sections still leaves us with questions, assuming we have the skills to do so. If architecture is above all an experiential art, how can a reader rise above the limitations of the book? Richard Copans and Stan Neumann, producers of Archtectures for ARTE France from 1995–2007, used small teams of videographers and sound engineers to move beyond the limitations of still imagery. By choreographing complex camera movements, Architectures uses motion images to dynamically explain spatial and structural relationships, reveal sequences, and uncover the tidal-like forces of occupation and activity throughout the day. By sharing responsibilities, including writing, producing, and editing, as well as videography and directing, Copans and Neumann ran a lean, nimble, and adaptable team. While lacking the depth of Rayner Banham’s 330-page Theory and Design In The Machine Age, or Jenck’s more contemporary The Story Of Post Modernism, the 54 episodes of Architectures provides an overview of some of the most influential works of 20th Century architecture, with enough detail to capture the attention of both novice and those more fully informed. Their economy of production, combined with high-quality visual explanation became a prime motivator in the creation of this app. Furthermore, the huge leap in video quality of DSLR cameras around 2010 made possible the authoring of truly cinematic digital video, a capability missing for Copans and Neumann. Crystal-clear, high-definition imagery, smaller, lighter cameras and lenses, and an affordable price, I found, allow an individual to create media at a level of quality denied to that of even a mid-sized production house, just a few years ago. Unlike a photograph or painting, which allow the viewer the choice of when and where to focus attention, video is dynamic and fluid in nature, but the viewer has access to only a portion of content at any one time, presented in the order intended by the filmmaker. As John Berger notes in Ways of Seeing, this selection and ordering of information imposed through editing can impose the director’s point of view that may be contrary to the conclusions reached when viewing the original art work without such editorial influence. One of the attractions of interactive hyper media is the ability of a user to have at least a semblence of control over how information is examined and understood. While maintaining narratives becomes more difficult, excursions, digressions, and reflection are encouraged. While the Knowlton Hall Virtual Tour app remains relatively light on verbal explanation, users have control over their selection and time spent viewing photography and video. As in the episodes of Architectures, the media in the virtual tour app are loaded with information appropriate to all levels of experience, with an added advantage of exploration and intention: users can pick-and-choose from a variety of viewing experiences, while maintaining control and awareness of context. In this case, one can experience what’s around this corner, down this ramp, behind us or directly over head, or toggle back-and-forth from interior to exterior or from floor to floor with a swipe or click, while always being aware of our exact location. Contrary to a book, the use of video allows the capture of dynamic change and movement. In Knowlton Hall, where so many architectural effects are apparent, one must move from one area to the next to build a better inventory of both the spaces, and perhaps more importantly, their transitions. Video captures the juxtapositions of these effects and the gradients of the transitions with less fragmentation than photography or drawing. In a lecture at the university, the architects state that their intent was to create an “encyclopedic” example of architectural conditions, and the result is a building that is almost purely experiential—study of the plans, elevations, and sectional drawings reveal nether the richness of the building, nor it’s architectural effects in a way apparent in the drawings of Mies Van der Rohe, for instance. This is a building we must walk within to understand. While the media contained in the virtual tour was carefully edited and condensed, it still offers an expanded experiential understanding of the building far beyond the printed page. And unlike the time and expense necessary to visit the building for those around the country or on opposite sides of the globe, electronic distribution allows visitors to explore Knowlton Hall from anywhere in our wired, interconnected world. The Knowlton Hall Virtual Tour app gives them that opportunity. The Knowlton Hall Virtual Tour app will be available for the Android, iPad, and Kindle tablets later this summer. Please check back for updates. COLUMBUS—When architect Peter Eiseneman broke the rules with his deconstructivist masterpiece, the Wexner Center for the Arts quickly made a name for itself as a cutting-edge contemporary arts center and as one of the country’s best places to shop for arts-related media and products. The Wexner Center Store stocks thousands of books on topics ranging from film/video to painting, the performing arts, architecture, photography, and theory and criticism. In addition, they offer unique items for the home, hard-to-find film titles, jewelry created by local artists, unusual children’s toys, and Apple products. 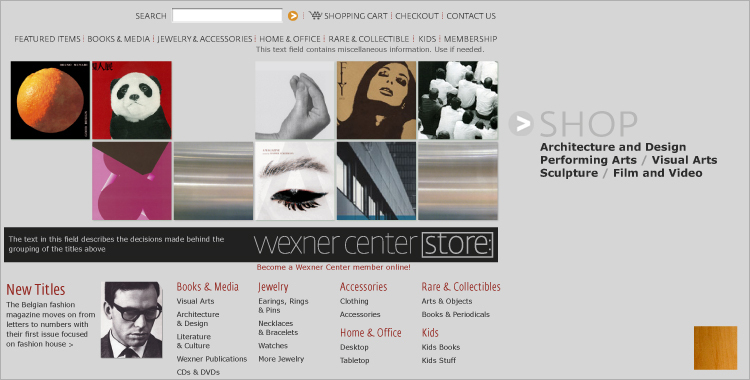 The visual redesign of the Store website makes allusions to the square module used in the brick-and-mortar store, including the custom glass showcases, shelving, and wooden panels lining the walls and additional references to building materials, such as stainless steel, glass, oak, and black wooden laminates. The 6 × 2 grid of the website is filled with graphics of available products and the designer can create new layouts by choosing from a variety of product shots. This simplification allowed for quick and easy updates, with greater extensibility. In the redesign, a focus was placed on creating a site with simpler information architecture, a more aesthetic user interface, and more conventional browsing and checkout features. Interior pages were organized to allow viewers a succinct view of available products with full descriptions, including title, publisher, and publication date, all presented at sufficient size and resolution for easier viewing. This version of the site was first published in 2006 and ran until its replacement in 2011.